Lionsgate saved the DVD and Blu-ray release of its animated road trip movie Alpha and Omega for Jan. 11, 2011, keeping it out of the busy holiday season and in time to be available for everyone who got gift cards for Christmas. 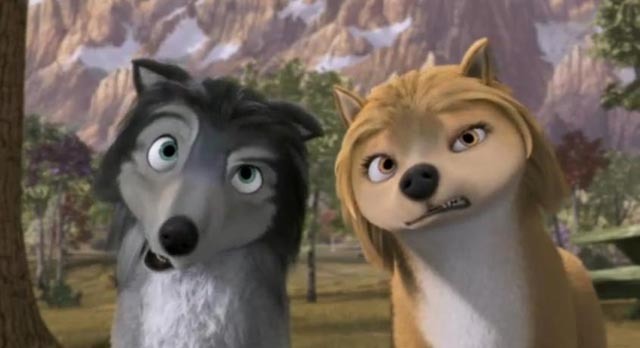 Set in Jasper National Park, the PG-rated family film follows the story of two wolves Kate (voiced by Heroes‘ Hayden Panettiere), who’s the Alpha daughter of the leader of the Western Pack, and Humphrey (Justin Long of Going the Distance), who’s the good-humoured Omega. Kate is forced to accept an arranged marriage with Jasper, a wolf of the Eastern Pack to unite the packs in peace, but before it can happen, she’s captured with Humphrey, who has a crush on Kate, by park rangers and sent to an Idaho park for wolf re-population. With the help of two odd geese, Humphrey helps Kate get back to Jasper, but during their adventure, they gain a deeper appreciation for each other. The voices of Danny Glover (The Color Purple), Dennis Hopper (True Grit) and Christina Ricci (Penelope) also are in the movie. In fact, Alpha and Omega is one of the last movies Hopper worked on before he died in May. The family film grossed $24 million, much less than other animated fare, such as Despicable Me ($244 million) and Disney’s Toy Story 3 ($414 million), but more than its reported $20 million budget. Also unlike Despicable Me, even though Alpha and Omega was released in 3D in theaters, it wasn’t released on Blu-ray 3D. The DVD was priced at $29.98 and Blu-ray at $39.99. The Blu-ray is a Blu-ray/DVD combo pack with a downloadable digital copy. and a Log Sliding game. From the creator of Open Season, Alpha and Omega received the Dove Foundation Seal of Approval. The movie also was released on video-on-demand the same day as the DVD and Blu-ray. Great to know about the BluRay release of Alpha and Omega. We missed it on cinemas and look forward to buying the Bluray. The response from all who have seen it was great and we were recommended to go and see this along with all in the family. Thankyou for the quick info!